To get the paperwhites started. Paperwhites all nestled in pebbles. I love Paperwhites…they are so sweet. I grow them every year…this year just doing one large bowl! They should be beautiful in one large bowl. OK, what are paperwhites? I have not heard this word before. Paperwhites are a bulb that do not need a “cold” spell to bloom. I always start mine around Thanksgiving to have blooms at Christmas. They grow tall and have little clusters of white star shaped flowers. You usually find them right along side Amaryllis bulbs at garden centers. 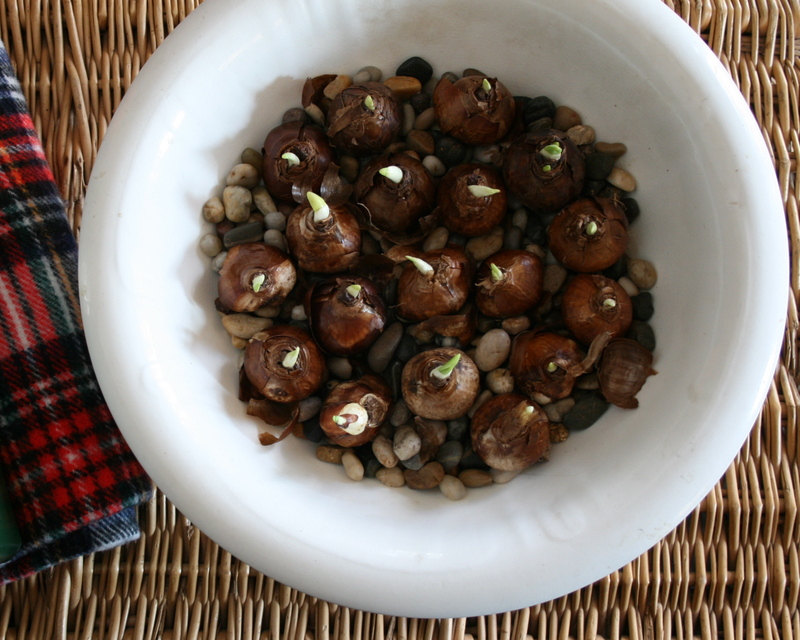 You do not need to plant them in soil either–just grab a bag of little pebbles at the dollar store, and add a few inches of pebbles to any container, nestle the bulbs in and add water just to the very base of the bulb. Mason jars are a perfect container and look sweet in a window sill. Add water as needed and they are fun to watch grow, then bloom. Happy Thanksgving Audrey. I’m not sure why, but that looks like there’s magic going on. When my kids were younger, they really did think it was magic. They would measure the the stems in the morning, then at the end of the day. They will grow sometimes 2 inches in one day! Magic for kids and grownups! I didn’t know the name paperwhites, and just had to look it up ! I see it is a type of Narcissus, a bit like a daffodil, but I also see they are forced as a house plant for Christmas, how lovely to have fresh, and live flowers in the house in December! Sorry I didn’t include more information, but so glad you were intrigued! I will sure show you my big bowl of paperwhites in all it’s glory. And so true, I crave a bit of “green” all Winter long, so these help! Love the idea of them and they are such beautiful flowers but unfortunately I’m super sensitive to their smell which makes me feel sick. 😦 Would love to grow them and yours will look stunning.